Distinguished among climbing schools, the 12-Day Alaska Program is a progressive-development, hands-on program. Our goal is to educate climbers in mountaineering essentials, giving graduates a firm understanding of alpine climbing skills. Once skills are learned, we quickly apply our knowledge offering the chance of up to 4 summit attempts. The curriculum covers the essentials of mountaineering including; glacier travel, self-arrest, navigation, route finding and snow skills in one of the finest alpine environments imaginable (full list of course objectives is below). The course culminates with a summit attempt of one of the peaks in the area of the South East Fork of the Kahiltna Glacier. Climb candidates include Mt. Francis (10,450 ft.), Kahiltna Dome (12,525 ft.), Point Ferene (9,300 ft.), Control Tower (8,670 ft.), or Mt. Crosson (12,800 ft.). In addition to the skill set listed below and the summit attempt, we look for this program to be a remote mountain experience, as we apply skills as we learn them with a keen eye on safety, personal maintenance, environmentally friendly campsite construction and Leave No Trace ethics. Sleds are used early in the course to familiarize students with their use on an Alaska Range expedition and to facilitate getting to our first training camp. Later in the course, students will be expected to pack carefully and properly when moving camp to meet later climbing objectives and avoid sled use. 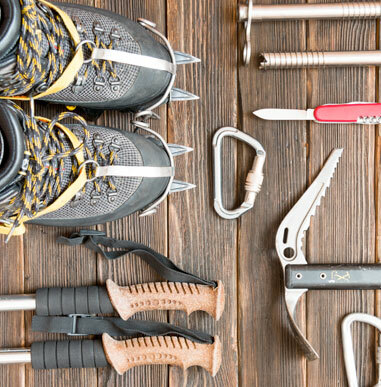 This is simply to help acquaint students with proper packing skills, which are necessary in most alpine climbing areas of the world. It should be noted that using sleds can broaden the meal choices. This serves as a prerequisite for many of Alpine Ascents’ intermediate-level climbs, including Denali, and is a stepping stone for more technically difficult mountains. Alpine Ascents International is an authorized concessioner of Denali National Park and Preserve. The Alaska Range is home to Denali (20,310 ft.), the highest mountain in North America. Denali has numerous vast glaciers that flow down to an altitude of 2,000 ft., creating over 18,000 ft. of glaciated terrain and the highest relief from top to bottom of any mountain in the world. Surrounding Denali are hundreds of peaks, many of which represent the most sought-after climbs in the world. Most noteworthy are the vertical rock walls and narrow corniced ridges of Mount Huntington and the endless ice routes of Mount Hunter. Climbers reach the Alaska Range via ski-equipped planes. En route to the glacier air strip we fly through the Alaska range, scanning breathtaking views of some of the most beautiful mountains in the world. Instruction takes place on the glaciers surrounding these mountains and we complete our course by climbing one or two of the smaller but equally magnificent peaks in the area. Control Tower (8,670 ft.) is one of the peaks that is climbed during the six-day course. It is a central landmark located behind our camp on the South East Fork of the Kahiltna Glacier. We ascend Control Tower from the North East. The route we climb is exciting; we traverse a narrow ridge, then up a final steep section. This climb is a great stepping-stone in the Alaska Range. Mt. Frances (10,450 ft.) is centrally located between Denali, Hunter and Foraker, and offers stunning 360-degree views from its summit. 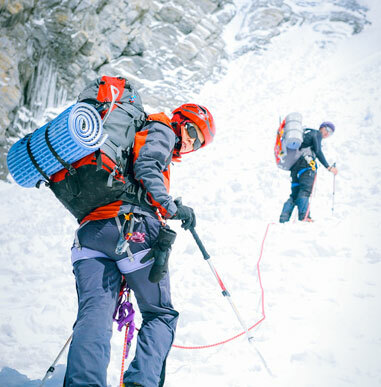 Our climb ascends the narrow East Ridge on snow and ice for approximately 2,000 ft., providing excellent climbing using all the skills we have learned during the course. Mt. Crosson (12,880 ft.) presents a two-day climb in which we set high camp halfway up on the South East Ridge. This ridge is steep and continuous for over 5,000 ft., offering excellent climbing and a great challenge for the aspiring alpinist. This climb is truly a classic. Kahiltna Dome (12,525 ft.), another Alaska classic, offers excellent climbing up the three-mile-long North East Ridge. The entire climb offers superb views of the West Buttress of Denali and Mount Foraker. Point Ferene (9,300 ft.), centrally located on the Kahiltna Glacier, is a satellite peak of the Kahiltna Dome. Ascending from the north, we use the same approach route as the climbers for Denali. The climb is a beautiful, moderate glacier climb. Please note you will be mailed specific information for your course upon registration. The following is to serve as a helpful guideline. We invite you to check out our Training page We highly recommend checking with your physician before embarking on strenuous physical activity. We reserve the right to turn away those climbers who we determine to be in inadequate physical condition. The best way to reserve space on a course is to call our offices and place the deposit on a VISA/MC/AMEX. You may also fill out a secure online application here. Our courses fill quickly on a first-come, first-served basis, and registering over the phone is the best way to ensure reserving the course dates you want. You may also submit an application by mail with a check, money order or credit card number. When should I fly in to Anchorage? Arrive in Anchorage by 4:30pm the day before your course starts and take a van shuttle to Talkeetna. Overnight in Talkeetna the evening before your course. The trip from Anchorage to Talkeetna takes approximately 3 hours. (Please coordinate with the Shuttle Service and your travel agent to arrive by 4 :30pm the day before your course to catch the Shuttle from Anchorage to Talkeetna.) You must pre-book your shuttle with the Shuttle Service. Details located in climber information sheet received in your registration materials. When should I fly out of Anchorage? Please fly out of Anchorage after 1:00 pm , the day after your course ends. You should plan to spend the night after your course in Talkeetna. Contact the Shuttle Service to book your return shuttle. PLEASE NOTE – flights to/from the glacier can be delayed due to inclement weather. Alpine Ascents uses the services of Charles Mulvehill at Scan East West Travel: 1-800-727-2157 or 206-623 2157. They are very familiar with our Mountaineering School and offer competitive prices on all domestic and international flights. charles@scaneastwest.com You should arrive in Anchorage no later than 4:30pm the day before your course. Book early! How do I get from the Anchorage airport to my hotel in Talkeetna? Please contact Shuttle Service to inform them as to your arrival time and to schedule a shuttle. Details located in your confirmation materials. What kind of experience do I need to take a course? Our 8-Day program is designed for the beginner or intermediate climber wishing to develop strong fundamental skills in all aspects of snow and glacier climbing. Our 12-Day course is designed for both beginning and intermediate climbers who are in excellent physical condition and serious about acquiring in-depth experience in all aspects of alpine climbing. Recommended Lodging: Talkeetna Denali View Lodge. Please note this lodge is near our office, which is about 10 miles outside of town. If you wish to stay in “donwtown” Talkeetna please arrange lodging to our facility for your gear check and departure. Talkeetna Denali View Lodge– Stunning Historic Alaskan Inn on huge property. Millennium Alaskan Hotel. This is a quality hotel near the airport in Anchorage. Please review the Sample Menu Plan in your confirmation package. As part of the curriculum, you are responsible for your own food. Before departing for the course, we will check and organize personal/group gear. We advise you bring all food with you to Talkeetna as it is easier and more cost effective to shop before arriving. When shopping for expedition food, remember it is better to err on the side of too much food instead of too little! You should buy food for 1-2 days beyond your course. As part of your gear check, our guides will review your food and meal plan to ensure you are eating enough during the program. Please use the menu guide carefully and take time to plan all meals. As we fly to the Base Camp, you are able to bring additional fresh food and other “luxury items” not normally part of a mountaineering menu. We encourage you to call our offices with any questions. Big Helpful Hint: As we fly into the glacier very close to our base camp, you can bring and eat many of the same foods you eat at home. Climbers wishing to bring home style meals should have experience cooking these meals on a camping stove in a wilderness environment. In many ways you can think of this a place to bring “luxury food” as compared to other mountaineering/camping experiences in that you do not have to carry food a great distance. Please CALL with questions. Since everyone purchases different gear and is a different size, it is hard to give you an exact weight. For most of our courses, you can expect your internal frame pack (packed with gear and food) to weigh between 55 and 65 pounds. It is likely that you will be asked to help carry some of the group equipment such as ropes and protection, so make sure there is some additional room in and on your backpack for approximately 4-8 pounds of gear. Our 8-Day and 12-Day Alaska courses have a 5:1 ratio. We rent the Koflach Degree. The packs, crampons, ice axes, tents, and other items are cleaned and checked on a daily basis. All of our gear is of the highest quality. Please note that double plastic boots do not break in. Our 8-Day and 12-Day Alaska programs take place in Denali National Park in the environs of Denali itself on the South East Fork of the Kahiltna Glacier. Food is one of the basic pleasures of wilderness travel. There are countless options for putting together healthy and delicious meals for long wilderness trips, depending on how much time, effort and money you have to spend on preparation before and cooking during the trip. Thorough meal planning and preparation is a must! While all of our expeditions do include meals, our courses serve a broader function of teaching sustainability and self-sufficiency in the mountains. For this course, you will be responsible for bringing and cooking your own food. Guides will review all food items at the gear check. Emergency Rations: we recommend you bring 2 additional days of food in the event our return flight from the Alaska Range to Talkeetna is delayed by poor weather. Nourishment and mountaineering are inseparable for those who wish to successfully enjoy mountaineering. 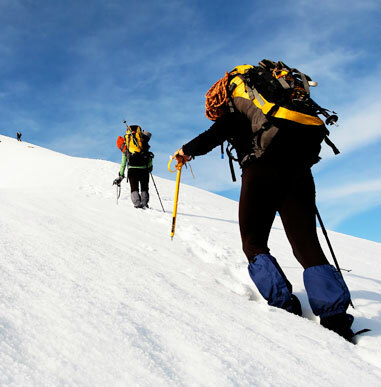 Climbing requires higher daily energy expenditure than most other strenuous activities. Eating well and frequently sustains energy levels and keeps us happy as well as helps us to combat the cold conditions and inclement weather we will likely encounter in Alaska. One of the most challenging parts of a mountain guide’s job is discussing and advising our climbers on the types and quantities of food to bring on a mountaineering expedition. Unlike clothing or sleeping gear where climbers simply have or don’t have an adequate item, food is somewhat subjective. For your course you need lunch food for 12 days. Determining the amount of lunch food to bring is difficult to gauge on your first mountaineering expedition. General guidelines are given below. The rule many guides work with is the weight of your lunch food should be equivalent to weight of your breakfast and dinner food added together. You will need 11 dinners for your course. Many guides bring a soup packet, like instant miso soup, for each meal (unless the meal is already soup based). This makes a great pre-dinner hot drink and helps keep us on top of our hydration. Don’t forget your Hot Drinks!